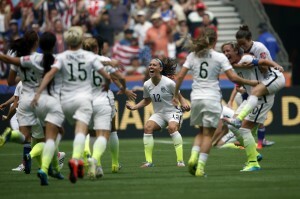 Why the paltry sum for FIFA’s female champions? Watch tonight’s PBS NewsHour for more. Left: The U.S. Women's soccer team won the World Cup, 5-2. Photo by Michael Chow/USA Today Sports.